Ten years after the terrorist attacks of Sept. 11, 2001, the events of that day retain a powerful hold on the public’s collective consciousness. Virtually every American remembers what they were doing at the moment the attacks occurred. Substantial majorities say that 9/11 had a profound personal impact and that the attacks changed the country in a major way. 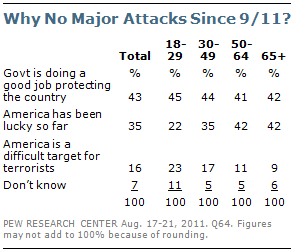 Yet the public continues to be divided over many of the anti-terrorism policies that arose in the wake of Sept. 11, and these differences extend to opinions about whether U.S. wrongdoing prior to 9/11 may have motivated the attacks: 43% say yes, while 45% disagree. 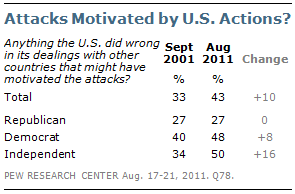 In late September 2001, 33% said U.S. wrongdoing might have motivated the attacks, compared with 55% who said it did not. The latest national survey by the Pew Research Center for the People & the Press, conducted Aug. 17-21 among 1,509 adults, finds that the public offers generally positive ratings of the government’s response to the terrorist threat. Yet when asked why there has not been another major attack on the U.S., 43% credit government policies while only somewhat fewer (35%) say it is because the country has been lucky so far. Overall, most think terrorists have either the same (39%) or an even greater (23%) ability to launch another major attack on the U.S. today as they did ten years ago. 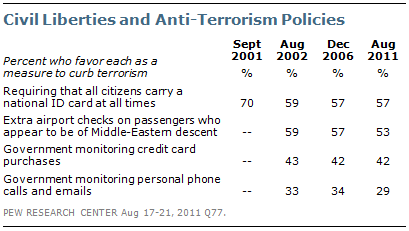 Just 35% think it is harder for terrorists to reach us today. Despite the killing of Osama bin Laden, as many say the U.S. has not captured or killed most of those responsible for the 9/11 attacks as say it has (47% vs. 45%). Moreover, only about a quarter say the wars in Iraq (26%) and Afghanistan (25%) have lessened the chances of terrorist attacks in the United States. In both cases majorities say the wars either have increased the risk of terrorism in this country or made no difference. 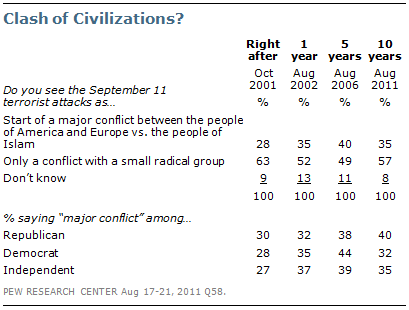 A decade after 9/11, most Americans reject the argument that the attacks triggered a “clash of civilizations” between the West and the Muslim world. Nearly six-in-ten (57%) say the Sept. 11 attacks led to a conflict with a small, radical group, while 35% say they began a major conflict between people in the West and the people of Islam. Yet Americans’ concerns about Islamic extremism, both in the United States and around the world, remain extensive. Two-thirds (67%) say they are very or somewhat concerned about the possible rise of Islamic extremism in this country, while 73% are at least somewhat concerned about the rise of Islamic extremism around the world. Virtually every adult today remembers exactly where they were or what they were doing the moment they heard the news of the Sept. 11 terrorist attacks. This recall is as high among those younger than 30 – who were only eight to 19 years old when the attacks occurred – as it is among older Americans. Among eight other historic events tested, only one – the assassination of John F. Kennedy in 1963 – is a vivid memory for virtually all of those old enough to remember the tragedy: 95% of Americans who were born in 1955 or earlier, and who would have been eight or older in 1963, say they can recall exactly where they were or what they were doing. That is virtually unchanged from 1999 (96%). President Obama announced that Osama bin Laden had been killed by U.S. forces. The other national event that resonated as widely as 9/11 and Kennedy’s death among those old enough to recall is Japan’s attack on Pearl Harbor. The Pew Research Center’s 1999 study found that 89% of those who were eight or older at the time of Pearl Harbor were able to recall exactly where they were or what they were doing when they first heard of the attack. Even today, 75% of Americans say the attacks affected them emotionally a great deal, and this feeling crosses regional, political and demographic lines, with one exception: 55% of those currently younger than 30 say the event moved them or affected them a great deal. That compares with 81% of people who are today ages 30 and older. Six-in-ten (61%) Americans say the terrorist attacks changed life in America in a major way, while just one-in-ten (10%) say life in America is basically the same as it was before the attacks (28% say life changed “only a little bit”). Again, this impression spans all segments of the country, including both young and old. Nonetheless, this is a substantially lower rating than Bush enjoyed at the time, when 86% approved of his job performance, including 96% of Republicans, 85% of independents, and 81% of Democrats. Younger Americans are also more likely to say U.S. actions might have motivated the attacks: 52% of 18 to 29 year-olds, and 47% of 30 to 49 year olds express this view. This compares with just 39% of 50 to 64 year olds and 20% of those 65 and older. Three-quarters (76%) of Americans say the government is doing very (27%) or fairly (49%) well in reducing the threat of terrorism, and for most of the past ten years, at least two-thirds of the American public, including majorities across party lines, have offered this generally positive assessment. The one notable exception was in January 2007, as George W. Bush announced his “surge” strategy for the war in Iraq. Positive assessments of government performance on terrorism fell to a ten-year low of 54%, due mostly to the negative assessments of Democrats. While 2007 was an extreme, there has been a partisan divide in assessments of government performance on terrorism from the very beginning. The direction of this gap switched when Barack Obama took office. 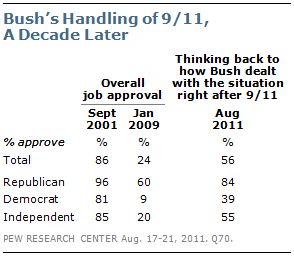 From 2001 through 2008 Democrats offered decidedly more critical views of government performance on terrorism. 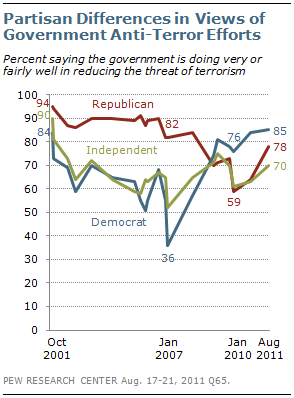 But by October 2010, Democrats expressed more positive views of the government’s anti-terrorism efforts than did Republicans. When asked why the U.S. has not suffered another major attack since 9/11, fewer than half (43%) say the main reason is that the government is doing a good job protecting the country; 35% say America has been lucky so far, while 16% say the main reason is that America is a difficult target for terrorists. Throughout much of the past decade, there has been substantial skepticism that the war in Iraq has improved America’s security. Currently, 31% say U.S. involvement in Iraq increased the chances of another terrorist attack here, and 39% say it made no difference. 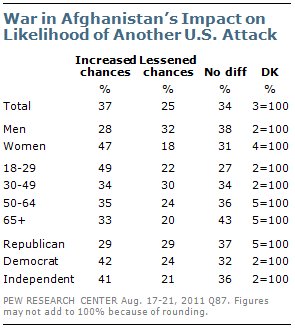 Just 26% say the war in Iraq has lessened the chances of another attack. Evaluations of the war in Afghanistan are similar – 37% say it has increased chances of another terrorist attack in the U.S., 25% say it has lessened the chances of an attack, and 34% say it has not made a difference. Democrats are more likely than Republicans to say the war in Afghanistan has increased the chances of another attack on U.S. soil (42% vs. 29%). Independents tend to share the views of Democrats, with 41% saying the U.S. is more at risk because of the war in Afghanistan. One of the largest gender gaps in the survey is over Afghanistan’s effect on our national security. Women are far more likely than men to say that the war in Afghanistan has increased the chances of another terrorist attack against the United States (47% vs. 28%). Men are far more likely than women to say it has made us more secure (32% vs. 18%). As time has passed since 9/11, fewer Americans think it will be necessary to give up civil liberties in order to curb terrorism in this country. Currently, 40% say the average person will have to give up some civil liberties, compared with 43% five years ago, 49% one year after the attacks, and 55% in the weeks following the 2001 attacks. And for the most part, there has been little change in the public’s view of specific policies and policy proposals. A 57% majority is in favor of requiring all citizens to carry a national identity card at all times to show to a police officer. Support for this idea was as high as 70% in the weeks following the attacks in 2001, but fell to 59% by August of 2002 and has remained steady since. Just over half (53%) support allowing airport personnel to do extra checks on passengers who appear to be of Middle Eastern descent, while 43% are opposed to this. Again, the balance of opinion is largely unchanged. 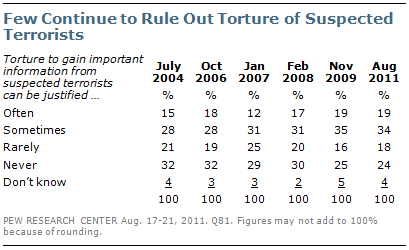 There also has been little change over the years in opinions about the use of torture against suspected terrorists. Currently, a majority (53%) says the use of torture against suspected terrorists in order to gain important information can be often (19%) or sometimes (34%) justified; fewer say the use of torture under these circumstances can be rarely (18%) or never (24%) justified. When the Pew Research Center first asked this question in July 2004, a majority (53%) said the use of torture could be only rarely or never justified. But in November 2009 and in the current survey, narrow majorities have said torture can at least sometimes be justified. As in the past, there are wide partisan differences in views of whether torture can be justified to gain important information from suspected terrorists. A substantial majority of Republicans (71%) say torture can be at least sometimes justified, compared with 51% of independents and 45% of Democrats. Two-thirds of Americans (67%) say they are at least somewhat concerned about the possible rise of Islamic extremism in the U.S., with roughly half of those (36% overall) saying they are very concerned. Concerns about the possible rise of Islamic extremism have declined since April 2007. At that time, 78% were at least somewhat concerned, while 46% were very concerned. Concerns about possible domestic Islamic extremism are particularly acute among Republicans 54% are very concerned about this, compared with 36% of independents and 24% of Democrats. Republicans also are likely to say there is at least a fair amount of support for extremism among Muslims in the U.S., as well as to say that support for extremism is growing. Overall, the public is divided over how much support for extremism exists in the U.S. – 40% say there is a great deal or a fair amount, while 45% say there is little or none. For the most part, the public does not see the Sept. 11 attacks as the start of a major conflict between the people of America and Europe, and the people of Islam. But more see such a major clash between Islam and the West than did so in October 2001, a month after the attacks. Currently, 57% say the 9/11 attacks were the start of a conflict with a small, radical group while 35% think the attacks began a broader conflict between the people in the West and the people of Islam. In October 2001, Americans rejected, by a two-to-one margin (63% to 28%), the idea that the attacks signified the start of a major conflict between the people of the West and the people of Islam. People who are currently younger than 30 are far less likely than older Americans to say that the Sept. 11 attacks affected them a great deal emotionally. 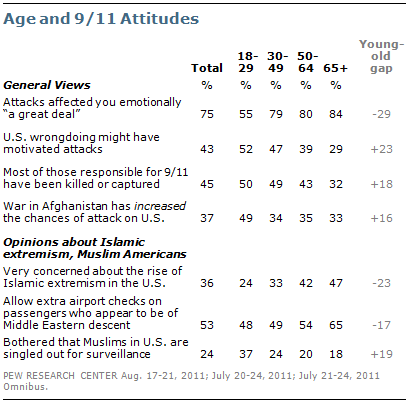 There also are large age differences in post-Sept. 11 attitudes related to Islam and Muslim Americans. Americans age 65 and older are about twice as likely as those under age 30 to say they are very concerned about Islamic extremism in the U.S. Conversely, the young are roughly twice as likely as seniors to be bothered by their belief that Muslims are singled out for increased government surveillance and monitoring. Younger Americans also are less supportive of extra airport checks on people who appear to be of Middle Eastern descent. At the same time, younger Americans are the most concerned that the war in Afghanistan has increased the chance of another attack in the United States. 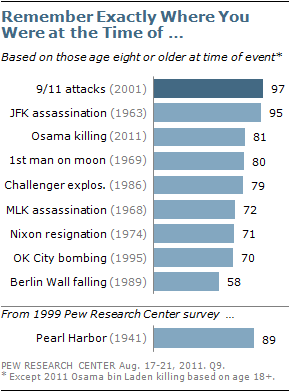 And while about half of those younger than 30 and those 30 to 49 say there are things the U.S. did prior to 9/11 that may have motivated the attacks, far fewer older Americans express this view.